Sunday morning, I had a very unique experience: I visited the set of a television show that I'd never seen. Now, I in no way say that out of malice towards CBS Sports Network's That Other Pregame Show. I just don't get the channel on my cable service. I found it an interesting experiment to make my first taste of this show one that was about as close as you could get. The even more interesting thing: I had mostly positive observations. For anyone needing a refresher, here's the gist of That Other Pregame show (CBS coloquially refers to it as TOPS, which reminds me of my favorite diner more than a television program): It airs for four hours (9 a.m. – 1 p.m. ET, though the last hour is almost totally dedicated to fantasy football) every Sunday. A lot of it is your typical NFL panel show, but it does things differently here and there. I visited in Week 11, so it would've been noticeable and upsetting if the cast didn't have any chemistry, but they have developed an interesting rapport. Host Adam Schein and analyst Brandon Tierney both come from New York radio and a place of high energy. Amy Trask, the first woman to serve as an analyst on an NFL pregame show, provides a different voice from her years of experience on the business side of football. Former Ravens and Jets LB Bart Scott completes the quartet. But it's Schein who keeps everyone moving, directs traffic and plays cheerleader for the entire crew of TOPS. At 8:30 a.m. ET on Sunday morning, Schein is loud, goofy and very excited to go on the air. At 12:30 p.m. ET, he exits a New York studio and is just as loud, goofy and very excited about what hapened during his three-plus hours on the air. He could probably power most mid-size cities with his energy. He's bounced around the New York area in radio (WFAN's Steve Somers once referred to him as "my son" when he'd fill in on his timeslot) and TV for years, and it's going to be fun to see if that sheer amount of energy will be infectious nationally. There are other contributors as well: Allie LaForce follows social media, but has found sort of an interesting twist on interacting with people by asking viewers to submit questions via Instagram videos. Nathan Zegura provides fantasy analysis, since you can't really do a football show without references to it. As mentioned, most of the CBS crew shows up, too. The question is: does the longest pregame show on television justify its run time? For the most part, yeah. There's some filler in there like a silly Tierney-hosted bit where he picks against a machine that simulates football games 500,000 times, and a pre-recorded segment on college football especially feeling like it's there for running time, but That Other Pregame Show usually feels most essential when it's the panel hashing something out. You've got four people having an interesting discussion. It helps that Trask and Scott are getting better. Trask commands the respect of the room whenever she speaks, and deservingly so. Scott is kind of a wild card, in that he bounces from the debate side of things to being able to discuss X's and O's. 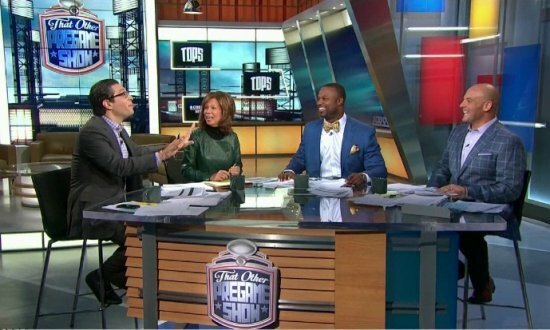 An example of the latter in a segment with CBS analyst Shannon Sharpe (the entire NFL Today cast made at least one appearance on TOPS) was one of the program's highlights. He can be as energetic as Schein and Tierney, but can come back and be analytical too. I was trying to figure out all day after I'd finished watching the show why I liked it. My opinion is that TOPS gets along by not taking itself too seriously, but in the right way. There are a lot of football shows that try to coast on phony yuks and set up jokes and sketches. That isn't how this show is silly. It's merely a reasonable football discussion, without acting like the world is ending – everyone's light and loose. The entire cast likes one other, and it shows. It probably didn't look this way from the start, but the phrase "easy chemistry" comes to mind. Sean McManus, chairman of CBS Sports, appears to think the same way in an interview I conducted following the show. "I think it's off to a really good start," he said. There's already dozens of hours of pregame shows on, starting Sunday afternoon after the games are over, there's nothing but pregame hours. Were trying to do a show that's different, it's a little lighter. For a show that's only been on the air a few months, we're happy with how its developed." One of the under the radar stories is how CBS Sports Network remains… well, under the radar, and happy with it for now. McManus has said that CBSSN will someday be in the ballpark of acquiring more high-profile rights, but also that it's a money maker in its current iteration. I'm certainly curious to see how the network develops, because if their content remains as interesting and evolving as That Other Pregame Show, then they'll get onto people's radars, no matter what they name their programs.